Castle Electric is famous for our quick response time; After all, if something	electrical has stopped working, you need it to be working again – FAST. For this reason, we make every effort to give service calls a scheduling priority. No matter whether your business is a Warehouse, Machine Shop, Tool &	Die, Aerospace Manufactures, Packaging & Production Lines or Bakeries,	we are the professionals to call	. 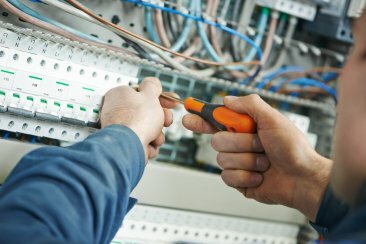 Our electricians have the experience needed to successfully complete	any size electrical project. And we are also fully licensed and insured	to $2 million. And, when it’s time to move, expand, or consolidate your operation,	Castle Electric can provide you with all the expertise you’ll need	to complete the process Hassle-Free. We will to do the job right the first time; every time, and we will also	be there for all of your maintenance and service needs in the future. Energy-efficient lighting represents one of the lowest-risk, highest-return	investments your company can make in green technology. For every dollar	you spend on a new lighting system, you’ll save 50 cents to 1 dollar	per year. That’s up to a 100 percent return on investment that keeps	on giving. Invest once and enjoy the savings year after year. Castle Electric	can assist you with lowering your energy cost. For a limited time only, many Utility & Power Companies are offering	huge rebates on new Energy Efficient lighting. In many cases, with these	rebates, our customers have seen total paybacks in as little as 12 months! Call Today, for your Free Comprehensive Facility Energy Audit.